Never thought I’d see the lowly river herring as front page news. But, there it was in the Journal News. Seems like the herring (alewife and blueback) are disappearing on the east coast and New York State is considering setting limits on how many anglers can take from the Hudson and its tributaries. You may think that this has nothing to do with the arts. And, it doesn’t really, but for the fact that artists are also concerned about the disappearance of certain species of fish which are either endangered or threatened due to pollution and over-fishing. This concern explodes in an exhibition at ArtsWestchester’s gallery entitled Fish Tales where 19 artists have created a fantasy sea world of oysters, eel, sturgeon, herring and other endangered species of fish once prevalent in waters around the metropolitan region. So rare are some of these species, that it is hard to believe that centuries ago, the Hudson provided so much food that Thanksgiving dinners were mainly a seafood affair. Our curator, La Benida Hui of R.A.R.E. (Rare Animals Really Endangered) happens to be a walking Wikipedia overflowing (pardon the pun) with tidbits about local waterways and wildlife. For instance, did you know that Oysters can clean water by filtering up to 50 gallons of organic pollution a day? Even better, consider the magical powers of the Shad, the Hudson’s largest river herring, which has an ability to detect ultrasound. I’m told that a lateral line along a fish’s length has cells that sense vibrations from nearby creatures. That perhaps explains how schools of fish swim so closely together without bumping into one another. Any sea creature with a shell can get “shell disease.” This shell game is caused by acid rain that lowers the PH of oceans. You can blame that one on global warming which is a trigger for acid rain. 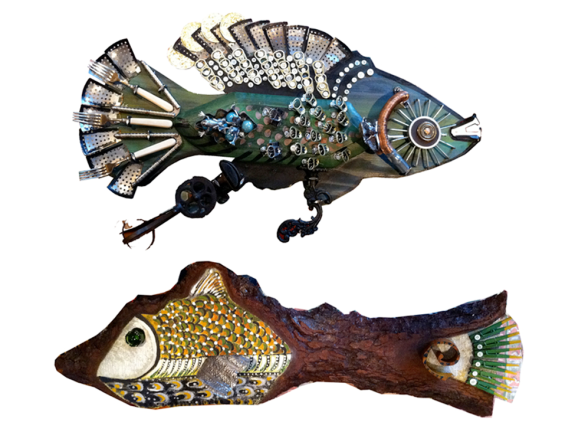 The art works in Fish Tales are constructed from found and recycled materials to underscore the much needed preservation of our state’s natural resources. This summer, stop by our gallery and learn what it would be like to be a fish swimming in the Hudson River or Long Island Sound, get to know the importance of our estuaries, and, yes, collect some fishy tidbits like the Shortnose Sturgeon, which predates dinosaurs and can live more than 60 years…that is, if they don’t smoke. Fish Tales is on view June 8 – August 11, 2012. Gallery hours: Tuesday-Saturday, 12-5pm.